Imparting straightforward and factual information about yoga, the book maintains an excellent balance: it is objective, truthful, and spiritual all at once. Kathleen Nitting’s Going beyond the Pose draws from experience and practice to argue that a lifetime of yoga strengthens the mind, flexibility, and everyday feelings of being present and at peace. Yoga is a physical, mental, and spiritual practice that’s thousands of years old. Going beyond the Pose speaks to the mental and spiritual side of the practice and its benefits. Breathing techniques, meditation, morning rituals, and introspective practices can be transformative, it argues, calming the mind and dimming the chaos of daily life. Nitting uses examples of her own hardships and transformations, acting as a witness to the monumental changes that come through dedicated yoga practice. The history of yoga is both ancient and fascinating, and Going beyond the Pose includes the necessary background information for understanding this deeply complex practice. Here, yoga structures are distilled in a digestible and relatable way, including the four paths of yoga, which dictate what goals align with what types of yoga; they are the starting point for any novice yogi. Imparting straightforward and factual information, the book maintains an excellent balance: it is objective, truthful, and spiritual all at once. It draws from other religions as well—Jesus and the Buddha are mentioned in the same sentence—and none are deemed right or wrong; they are examples for the ways that we all should strive to behave. 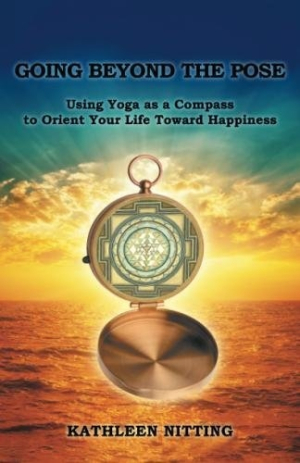 Suggested morning rituals, meditation prompts, introspective questions, and mental mantras are included under a “Living Yoga” header in each chapter so that the lessons of the book can be immediately applied. The work it takes to become a more loving, open person is difficult, and results are not instantaneous, Nitting warns. She is an adamant teacher, both championing the practice that has so worked in her life and avoiding claims that she knows what’s best for all. The book’s tone is candid and honest, refreshing and unpretentious, and should appeal to a wide audience. The book relays advice from noted sages and advisers, including Vietnamese monk and peace activist Thich Nhat Hanh and alternative medical advocate and author Deepak Chopra. Such quotations saturate the text, however; they come to feel like a regurgitation of information from more mainstay sources, and their inclusion is heavy-handed at times. Going beyond the Pose is about more than yoga; it is about the importance of living in the present, allowing flexibility into your life, and opening your heart to the possibility of change.